Virtual signage in the real world is still on the schedule for Google Maps. A handful of users, the augmented reality navigation all may try, and suggest that this is still in development. 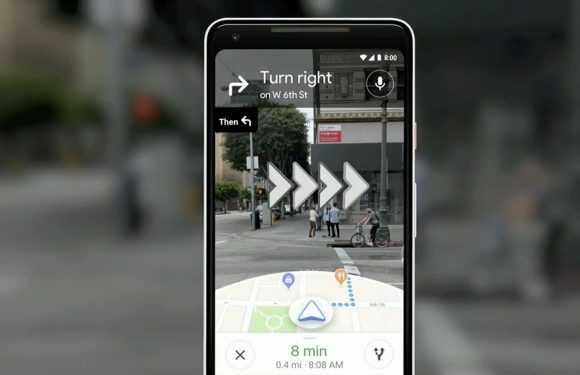 At the Google I/O developer conference itself in may of last year we got a first taste of augmented reality navigation in Google Maps. Since then, it remained silent, but a report from the Wall Street Journal shows that the option is still fully in development. A handful of users, including a reporter from the business paper, to test the new navigation now. According to Google, the feature is intended for situations where you for the first time in a new place. You step off the train or bus to get one last piece to walk, then you have probably happened to you Google Maps to put directly in the wrong direction. With the new mode, press and hold your smartphone up to virtual arrows between the real buildings to see. That works well, as evidenced by tests of the reporter. Maps has a second need for the navigation screen. The app then uses gps and Street View to get the arrows to show. On the lower half of the image you still get the ‘traditional’ navigation. Google seems well aware of the risks associated with the new navigation. As soon as the user begins to walk with the augmented reality navigation, a warning appears in the picture that you phone any way can stop. This prevents the app that you are not on the traffic and the people around you pay attention. When the augmented reality navigation is available for everyone, remains unknown. According to the Wall Street Journal is the now function even by a very small group of people tested. Google wants all the teething troubles for the public at large can start. The zoekbedrijf itself does not make any statements about a release date.